The idea for this graphic came to me whilst saving the chilli peppers from a forlorn looking, aphid-infested chilli plant that’s probably on its metaphorical last legs. I thought it would be quite interesting to look at the origin of the heat in chilli peppers, and how this can be quantified. 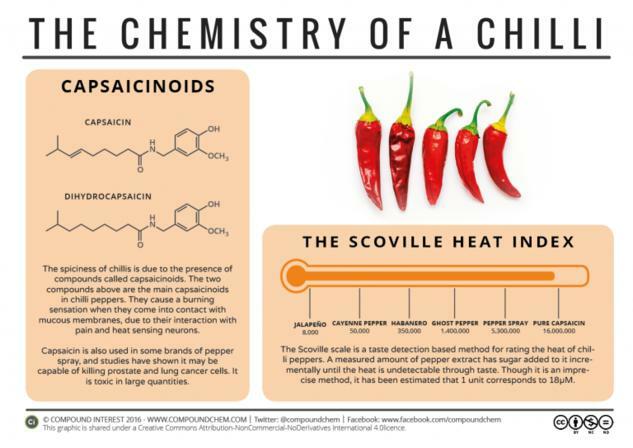 A family of compounds called capsaicinoids are responsible for the heat of chillies; within this family, several different compounds are found in the various varieties of chillies, but the dominant compound is capsaicin, a vanilloid, shown in the graphic.